With Enlightenment Theme you can create advanced and flexible page layouts where you can showcase any type of content by using tools that go beyond the WordPress post editor. After we have documented the purpose and usage of the template builder tools it’s time to deconstruct a practical example of a custom built landing page. With Enlightenment Theme you can create advanced and flexible page layouts where you can showcase any type of content by using tools that go beyond the WordPress post editor. After we have documented the purpose and usage of the template builder tools it’s time to deconstruct a practical example of a custom built landing page. In this tutorial we will present a step-by-step breakdown how to recreate the Theme’s Demo Home Page. This tutorial is part of the series “Enlightenment Theme Documentation”. Enlightenment is a powerful theme that can help you create advanced page layouts for your website, but may require a bit of mastering for beginners. Make sure to read all of the theme’s documentation tutorials to get the most out of this theme. Enlightenment Theme’s demo home page is a static page set as front page with its content highly customized. The level of customization in this page is achieved adding and removing components with the Page Builder, adding Custom Query Widgets to user-assigned sidebar locations and integrating these components with the theme’s Grid System. In the following we will go into detail about how to create and configure the static front page and the content for each of the page’s components, how toset up the required sidebar locations and add the corresponding widgets. To create a new page go to Pages → Add New. You can give the page any title as we will remove the title from the page in the next step. The page title will still appear in the browser tab and search engine results unless you override it with a SEO plugin like WordPress SEO by Yoast or All-in-one SEO Pack. We’ll just call our page “Home”. The content’s headline is styled as “Heading 3” and aligned to center via the editor. The leading text is added via the Bootstrap Shortcodes for WordPress plugin and the [lead] shortcode. Since this shortcode generates a paragraph we can’t manipulate its styling via the editor, so to align the text to center we have added the xclass="text-center" attribute to the shortcode. The non-paragraph line-breaks in the text can be inserted by pressing Shift+Enter. The “Read More” button was added with the [button] shortcode. The type="default" styles it with a white background and size="lg" makes its text larger. The href="…" attribute is the link the button points to. Since this shortcode does not generate a paragraph it can be aligned to center from the text editor. After you have saved the page as draft you can go ahead and apply page configurations. To give the page a more “landing page” look we will need to apply some customizations to its design. Note that to be able to use the page builder tools you first need to save the page as draft. If you’re editing a post with a post type different than page you may also want to remove the “Post Meta”. If you didn’t add any content to the page you’ll want to remove “The Loop” function from the “Content” hook instead. Great! It’s starting to look like a landing page canvas. Since “Full Width” is the default layout for pages, changing it is merely a precautionary measure in care you’ll ever change the default layout for pages. Now we can move further to the next step and configure the widget areas. Don’t assign these sidebars to any sidebar locations in the global scope as we’ll use them exclusively for our home page. Go back to the page editor and click on “Save Draft” to force a refresh of the page and make the newly created sidebars available. Then scroll to the bottom of the page and for the “Sidebars” meta box uncheck “Use default sidebar locations for page”. If you don’t see the “Sidebars” meta box, click on “Screen Options” in the upper right-hand corner and check “Sidebars”. Go ahead and save the page as draft now so you don’t have to come back here each time after adding a widget. Now that we’ve finished setting up the page, we can move further to generating the content components that will be added to it. For this part we’ll be creating some static pages that we’ll afterwards add to the page via Custom Query Widgets. Since these pages will also be accessible from their own URL it’s a good idea to instruct search engines not to index those pages. This can be done with a plugin like WordPress SEO by going to the “Advanced” tab and setting “Meta Robots Index” to “noindex” and “Include in Sitemap” to “Never include”. The Full Screen Slider is a Custom Query Widget of multiple pages added to the “Full Screen” sidebar. The featured images will be used as the background and the pages’ content will overlay on the image. First we will create 3 pages and add the corresponding featured images to them. The pages are then displayed in reverse-chronological order so you’ll want to pay attention to the order in which they’re published. You can give the pages any title as it won’t be displayed on the page. The content was made to occupy only half the width by inserting it in a 6 columns width with Bootstrap’s grid system. This is done by first wrapping in the [column md="6"] … [/column] shortcode and then wrapping the entire content in [row] … [/row] shortcodes that are required to wrap all grid columns. The [button] shortcode with type="default" attributes renders as with a transparent background and white border in the slider. 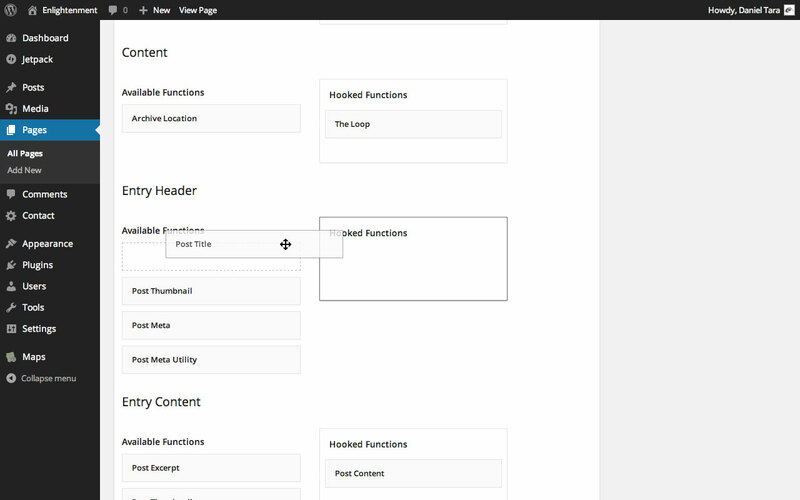 Bootstrap’s Media Components are content blocks with a headline and image floated to the left. You can observe 3 such components on the home page under the slider. For the media components we will create 4 pages, the first containing the headline and description of and the other 3 the media components themselves. As you can see, media components need to be wrapped in the [media] shortcode. The image is wrapped in the [media-object] shortcode and the pull="left" instructs that the object will be floated to the left. You don’t need to align the image itself to the left. The content is wrapped in the [media-body] shortcode and the title="…" attribute denotes the content’s headline. You don’t need to add any heading inside the content. The “Download Now” Call to Action is added to the “Secondary Header” sidebar which by default on pages with the “Full Screen” design displays on a light-gray background. The headline is styled as “Heading 3” and the button is added with the Bootstrap Shortcodes plugin, both aligned to center in the editor. Since the Custom Query Widget supports querying any post type, we can present a preview of our latest projects added with the Jetpack Portfolio post type. For this section we will need to create only one page with the headline and description similar to the step above and insert it through a Custom Query Widget in the “Home Main” Sidebar. We won’t repeat the process since it’s identical to the example we’ve already covered. Note that you can also add a title and description directly in the Custom Query Widget but you can’t customize its font size or text alignment. Hang on, we’re already half through the process! For the image gallery section we have configured the “Home After Content” sidebar to display in 2 columns. While the Custom Query Widget can display in multiple columns it does not display multiple types of content and this is where the sidebars’ integration with the grid system comes in handy. Sometimes it’s more convenient to style content just with the text editor without messing with shortcodes or other plugin-generated content. To your amazement, the 4 columns of content, each with an image, headline and description, were created just with the text editor and added via the Custom Query Widget on 4 columns. The image carousel was added to the “Footer” sidebar that, like the “Secondary Header” sidebar, displays on a light-gray background in pages with the “Full Screen” design. The theme’s templates weren’t widgetized only to support the Custom Query Widget but to extend the theme’s ability to support content generated by any plugin. You should be able to use widgets of any type in the theme’s sidebars and if they’re properly coded should also render correctly. At this point we have completed the creation of our home page and, if until yet we have just saved the page as draft, now it safe to publish it. This was the verbatim deconstruction of what we considered was a rich landing page that can properly demonstrate what kind of pages can be created with Enlightenment Theme. If you feel this was long not as simple as you expected we encourage you to give it a chance. Once you’ve mastered the way the theme’s tools work, creating amazing pages will become simple and intuitive. And by all means, don’t stop here! If we wanted to limit the theme’s ability to creation of such pages we would have made a static template. We have created this level of flexibility to encourage you to create your own unique and amazing landing pages. Use the knowledge you have gained from this tutorial to create the pages you need to make your website stand out and let of know of your results, we’d love to hear what you’ve come up with using our theme! Don’t forget to read our other tutorials that cover Enlightenment Theme’s Documentation. Remember Enlightenment is an advanced and very flexible theme that allows you to create amazing layouts and showcase any type of content in multiple ways, you don’t want to miss out on what pages you can create with this theme! thank you very much for this amazing theme, its a great joy to work with it. However, I have stuck a bit with it. I’m trying to keep my actions aligned with the wording of the tutorial but after creating the basic pages for the slider, added the widget to the sidebar, it doesn’t show up when I save the page to see how it looks like, only the content of the Home page is visible. I tried to set everything up as it was written, the only difference has been that I’m not paying attention to the content yet, so I put in dummy text for the moment. I have enabled the qtranslate plus plugin to see if it works well together. One little addition: there seems to be something wrong with the widget because I tried to add the Meta widget as well and it doesn’t show up either. You probably didn’t assign the sidebar to the corresponding location as outlined in the tutorial under “Assigning Dynamic Sidebars to Sidebar Locations”. Many thanks, you were right, I made a mistake with the assignments, an entry remained unsigned in the long list. Thanks a lot for the support and for the great work! I’ve been able to make a great school portfolio with your template. Enlightenment Theme is a modern, flexible and multipurpose WordPress theme. This one of the best theme which I have seen. Some of my favorite features of this theme are : free of cost, easily customize, tweak and speed up your website’s development process. Thank you for your kind words Amy. We’d love to see how you put it to work for you. I am having the same problem as Viktor – caveat I don’t want to use all the dynamic location so I assigned the first three and I cannot save the location on the page, I also have to disable the use default location every time after page save. Usually when this happens there’s a plugin tampering with user permissions, usually those that fall in the event calendar or directory management category. Try disabling your plugins one-by-one and see which of them is causing it. I have been using this theme as kind of a boiler plate or foundation on which to build WordPress sites from scratch. I have been able to create a whole range of different sites from general blogs to ecommerce and business sites. I just wanted to say a quick thank you for creating Enlightenment it truly has simplified and sped up my WordPress work. Thank you for your appreciation. This is the exact purpose Enlightenment theme was created for. I’d love to see your work so please send me some links. – the fact to use a lot of sidebars, is it a problem for ressources used to display the pages? – if I want to customize 10 pages each with all the sidebars I will have 100 sidebars in the sidebars management pages, is there a possible problem of ressource? Like WordPress has problem with the menu manager when there are a lot of pages. Do you plan to make the sidebars management page easier to manage a lot of sidebars? So my main interrogation is about all theses sidebars, the ressources it uses and the management of theses sidebars. Do you make some tests about the ressources used by your theme? What do you think about that. Yes, there are performance issues when adding many sidebars but they only occur in the admin, not on the front-end. I agree that a more user friendly solution is required but don’t have any ideas. If you have any suggestions I’d love to hear them.